I’m not being fair. Maybe it’s worth trying to parse out why it is that I feel suspicious of a book of this type, and what precisely a book of this type means. It’s the kind of book that’s deemed high literature, but that also isn’t so complicated that it can’t be brought over into other languages. García Márquez might be seen as a starting point for this (one could maybe go back further to Hermann Hesse) though I’m really talking about books from the past twenty years: Milan Kundera might fit in here, though he might also be more of a father figure, Salman Rushdie’s output for the past twenty years certainly does, Umberto Eco to an extent but more someone like Alessandro Baricco. Paulo Coelho doesn’t quite fit into this as he’s not quite high art enough. Saramago and Coetzee probably don’t quite fit in here, though a case could be made for them. But what I’m getting at is the highbrow that’s not particularly taxing: these books are working in established forms. There’s a touch of metafiction, but not enough to undercut the reader’s immersive experience; there’s a strong belief in the power of literature. The sources of this particular book aren’t particularly hard to guess at: there’s Borges, of course, and Faulkner’s As I Lay Dying, where this book’s narrative strategy (each chapter gets its own first-person narrator) springs from. There are hints of Nabokov’s Ada; there’s a fair amount of Milorad Milorad Pavić’s Dictionary of the Khazars, with the presentation, then reinterpretation, of story after story. The Italo Calvino of Mr. Palomar and Invisible Cities can be found here. 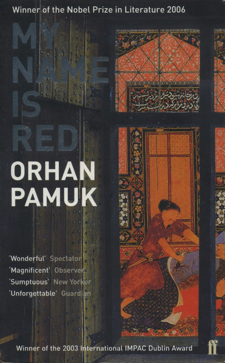 I would be interested to know if there are Turkish sources for Pamuk’s narrative strategies: there’s an offhand (and rather funny) mention of the Thousand and One Nights, but Pamuk’s style seems to be an amalgamation of American and European styles. So this is a book that seems to me more derivative than not in terms of how it’s done; that said, it’s still a pleasant enough book to read. Pamuk’s subject, the world of Ottoman miniaturists in the late sixteenth century, is still unfamiliar enough to feel fresh, even if it seems strange to depict this world in such a contemporary way. This is germane to the art crisis at the center of the book: Western perspective vs. the Ottoman tradition: we see the end of Ottoman tradition through Western eyes; we know, of course, how this is going to end. Maybe the trick of doing each chapter from a different character’s perspective is designed to emulate the Islamic tradition of depicting each person or object perfectly (something like a Platonic ideal); but it comes off more as Faulkner than anything else. This is a book of ekphrasis, and in that it succeeds: it’s about the pleasure of looking at pictures. The sort of pleasure depicted here is one very different from what we’re accustomed to: the miniaturists create masterpieces for sultans, but when these masterpieces are given to the sultan, they end up in the treasury, unseen by anyone. (Sultans are invariably depicted as boorish and not interested in anything but their own glory; they will not look at the pictures.) The great masterpieces of the past, then, can only be imagined; they are immune from the plague of criticism. The miniaturist’s career, at least in Pamuk’s version, always ends in blindness (one of the most explicitly Pavić-like elements), but this can be read as the apotheosis of looking at pictures: the blind miniaturist knows enough about illustration to never need to see them again. The masterpiece is unattainable; the viewer is almost incidental. There is, of course, the hint that painting is a stand-in for writing: the main character of the novel is not a miniaturist, but a man hired to write narratives to go with illustrations; he has a stepson named Orhan. This isn’t intrusive; nor is it conclusive. The cover of this book, done by Pentagram, might be thought about, simply because it’s not really explained. We see a window frame; through the window, we see what seems to be an Ottoman miniature, one man stabbing another with a dagger. The window frame comes from Robert Campin’s St. Barbara, in the Prado from 1438; it’s the window in the background, which has been reversed to better fit the cover. I don’t know where the miniature comes from; the credit says “British Museum,” which seems a bit lazy. This is an unexpectedly smart cover for the book: an Ottoman past seen through a Western perspective, manipulated through Photoshop. This entry was posted in reviews and tagged orhan pamuk. Bookmark the permalink. You are describing my own experience with Pamuk, three novels now, although not this one. I pick apart the traces of other writers, often my all-time favorites, and am left with – what? Proudly powered by WordPress | Theme: With Hidden Noise by Dan Visel.